The laser beam splits the pigment particles to smaller molecules. Most of them remain in the skin. However, their size is reduced with each treatment by the splitting, and they become so tiny that the human eyes can not really perceive them. The tattoo or pigmentation becomes “invisible” for our eyes. It gives the impression as if the pigments were removed. A part of splitted pigment particles are excreted by the lymph channels out of the body. But in the course of time, this happens with every pigmentation or tattoo, even without laser action. The smallest particles of color dissolve and leave the body. Therefore, an old tattoo / permanent make-up looks more pale and blurry than in the first time. The interval between laser treatments is 1.5-2 months. The number of treatments varies and depends on size and density of tattoo / pigmentation. On average, you should expect 5-10 sessions (so the complete laser removal takes about 1-2 years). The laser removal of pigments is modern and convenient, but there are some risks that one should know. Below we introduce you to some hazards of laser removal. After the decomposition of organic / synthetic pigments by the laser different toxic compounds can arise. They migrate through the lymph channels in the body and may possibly accumulate in the lymph nodes. Likewise, pigment particles that are released by the laser action can “get stuck” in the lymph nodes if they are not small enough to finally leave the body through the lymph channels. The fission products resulting from the laser treatment are currently not sufficiently researched. It is only known that they are harmful for health (including carcinogens) and may trigger allergies. Bei sachgemäßer Anwendung beschädigt der Laserstrahl keine Hautzellen, sondern wirkt selektiv nur auf Farbpigmente ein. Dafür muss das Lasergerät richtig eingestellt und auf den jeweiligen Hauttyp angepasst werden. Das erfordert Erfahrung und Fingerspitzengefühl. Ist das Gerät falsch eingestellt, kann dies zu Blasenbildung und Hautverbrennungen führen. Und dadurch können folglich Narben entstehen. The main hazard of laser removal for the skin surface is is the risk of permanent scars and burns. When used properly, the laser beam will not damage skin cells, but will selectively affect only color pigments. To do so, the laser device must be set correctly and adapted to the individual skin type. That requires much experience and tact. Setting the laser device incorrectly may cause blistering and burns, which can lead to permanent scars. One case in itself is the removal of pigments based on acrylates and similar compounds (they are often used in microblading). 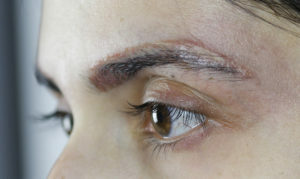 Such pigments can melt under the laser beam in the skin, resulting in internal skin burns and scars (see picture on the left). In addition, these pigments are often not recognized and removed by the laser. Instead of lightening / removal, damage to the skin structure may occur. Unfortunately, the clients often do not know which pigments they carry in the skin. This complicates the matter, as one never knows how the tattooed / pigmented body will respond to a laser treatment. Before working on a whole tattoo, a test laser treatment schould be done at a smaller skin area. Some colors are not recognized by the laser and consequently not removed. Or much worse: the pigments are recognized and change their color under the laser beam. This mainly happens to white and beige pigments (titanium oxides). These are often become green or dark gray under the laser beam. Sometimes, they can be decomposed and removed in the following laser treatments. But usually, the changed color can not be removed with laser at all. 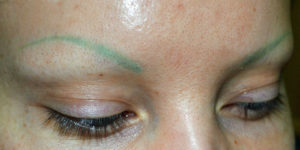 Especially the pigments which turned into green, remain permanently in the skin and can only be removed by other methods. Other pigments (mostly those of organic origin) are often not “seen” by the laser. These include many reds, oranges, greens and blues. Incautious or incorrect handling of the laser device may cause risks to the eyes. Since this application works with wavelengths of optical radiation which reach the retina in the eye, permanent damage to the retina is possible in case of improper handling and lack of eye protection. This is very important for the removal of pigments on the eyelids. The eyes must be very well protected, e.g. through special metal lenses that are placed on the eyeball before treatment. After laser treatment, light spots (hypopigmentation) may remain on the skin. This happens, because the laser affects not only the tattoo pigments in the skin, but also the body’s own pigments. Hypopigmentations are usually permanent. These skin areas get no more sun tan. One of the alternatives is the removal of pigments with Remover. More information: Function and Ingredients. In the remover method, the pigments are removed from the skin in a similar way as they were implanted. They are extracted to the skin surface and do not remain in the body. When used professionally, this method is fast, non-scarring and very effective, as pigments of all types and colors can be removed.